I’ve always loved to bake and cook. When I was sixteen, my mom started to work outside the home. Even though my dad was a good cook, we kids took turns making meals, and everything was made from scratch. When I got married, I became a member at my husband’s church. It is a Danish church with some of the original members’ grandchildren and great grandchildren still attending. Every year we have a Danish Festival to celebrate the Danish heritage. We make Kringle and Abelskiver, along with other Danish treats. About 20 years ago an elderly lady at our church gave me a recipe for the Danish Kringle that her Danish family made. After spending twenty years fine-tuning the recipe with some loving yet slightly obsessive diligence, I perfected the recipe we now use for our kringle. This pastry melts in your mouth, and leaves you wanting more, especially when it is filled with your favorite fruit or caramel nut fillings. They are made with layers of real butter to give them that melt-in-your-mouth flakiness and leave you wanting more. In August of 2009 we introduced the public to these kringles, when we opened Olde World Pastries Plus, LLC. We are a family owned small business, with a tradition of good old-fashioned pastry recipes. My husband is half Danish and half Czech and I am German, so we have a variety of traditional recipes from our heritage. Along with the Danish Kringle, we make by order Danish Layer Cake, assorted Cakes and Cupcakes, German Stollen, Czech Houska, Kolache, Christmas Bread, assorted Christmas Cookies, Turnovers and Elephant Ears. As children, we went to our grandparents’ home it was with great anticipation, because we knew there would be special treats waiting for us, and we could smell them when we walked in the door of their home; it was the aroma of your favorite dessert waiting for you along with the hugs and smiles. 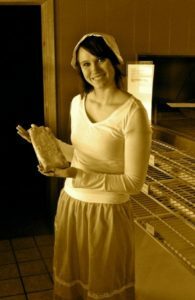 At Olde World Pastries Plus; we want you to have that experience – the one we had as children growing up. The aroma of great pastries and the anticipation of that special treat that is made with love, and a friendly smile. Specials and New Items change daily. Stop in and check out our latest creations! We can help you raise significant funds for your organization. Stop by or give us a call for more details.